Expecting a more positive reception than it received two years ago, the Columbia-Snake River Irrigators Association in Kennewick, Washington, petitioned the Trump transition team to convene the Endangered Species Act Committee, also known as the "God Squad," for a "reconsultation" of the Federal Columbia River Power System biological opinion for salmon and steelhead. In 2014, the organization of upriver irrigators also petitioned to convene the God Squad, frustrated by more litigation challenging the BiOp. U.S. District Court of Oregon Judge James A. Redden had already issued his latest remand – the fourth such action – of an FCRPS BiOp. CSRIA said at the time that the God Squad intervention was needed to "halt excessive and unbridled litigation directed toward the region's electric power ratepayers." The most recent petition to convene the God Squad was triggered by U.S. District Court of Oregon Judge Michael H. Simon's remand, the fifth remand of the BiOp, and the resulting scoping meetings conducted by the U.S. Army Corps of Engineers, the Bureau of Reclamation and the Bonneville Power Administration in towns and cities around the Columbia River basin. The agencies are seeking comments on the scope of what they should consider when preparing a new environmental impact statement of the FCRPS. The EIS will inform the next NOAA Fisheries BiOp for salmon and steelhead, slated for 2018, but maybe not if the ESA Committee intervenes. One of the options put back on the table by Judge Simon is breaching the four lower Snake River dams, leaving a free-flowing Snake River downstream of Idaho Power's Hells Canyon Dam. That would reduce CSRIA members' irrigated acreage by about 60,000 acres, according to Darryll Olsen, board member of the organization and principal in the Pacific NW Project. The acreage includes water that would have been pumped from Lower Snake River reservoirs and from the upper McNary reservoir where it is backed up into the Snake River. "These pump stations would not function without dramatic alterations, and the reduced pool elevations of the river and unstable flows would not be easy to overcome," Olsen said. "The end result would be a substantial reduction in irrigation acres, even with re-engineered pump stations. "These pump stations are not Tinker Toys – the dams are not Tinker Toys for children to play with..."
The Endangered Species Committee, created as part of congressional amendments to the Endangered Species Act, can be called together to decide whether a federal agency, or agencies, can be exempted from responsibilities regarding the protection of listed species. It was done with the spotted owl in the 1980s and again in the George W. Bush Administration to allow some logging on Bureau of Land Management lands, although that ruling was reversed by President Bill Clinton. "The Endangered Species Act (ESA) was not framed as an instrument for endless public funding for a self-serving ‘salmon recovery industry' nor as a platform for brandishing judicial bias," the CSRIA said in its letter to President-elect Trump's leadership team. "Actions under the ESA have limits--the ESA Committee can and should set the responsible boundaries for hydro system operations. Those boundaries should reflect competent resources management, not empty gesture environmentalism." CSRIA sent the memo November 21 to put the issue before the new administration and get it to begin to think about this God Squad issue, Olsen said. Two years ago the petition was sent to the current Democratic administration and state governments and nothing happened, but this time "without question, we expect a better reception" than in 2014, Olsen said. He said the Interior Department can initiate the Committee if it determines that jeopardy cannot be avoided. "Judge Simon already made that decision when he decided the BiOp is not good enough to prevent jeopardy," Olsen said. He added that the region has already "reviewed this to death." "A lot of people have forgotten this God Squad feature in the ESA legislation," Olsen said. "It's there and there's nothing wild and crazy about it." 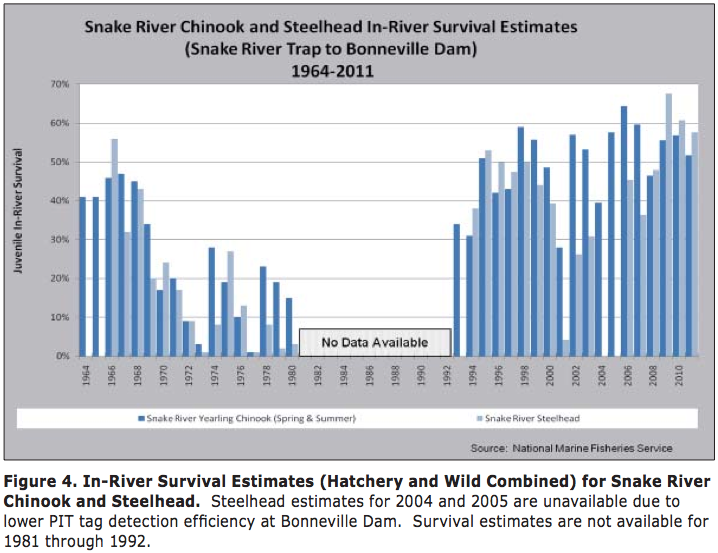 "This renewed EIS process emanates from Oregon Federal Judge Michael Simon's incomprehensible decision ignoring two decades of federal agency work to improve Columbia-Snake River fish runs, about $15 billion of rate payer funding, actual fish run survival through the hydro system, and factors outside the Columbia-Snake River System that overshadow fish production," the CSRIA letter says. "Further disregarded are extensive technical analyses, and the tens-of-millions of dollars rate payers' spent on them, that have already evaluated the destructive measures outlined in Judge Simon's BiOp Remand Order." The CSRIA is not asking for significant changes to the current BiOp, although some people would call some of his ideas "rollbacks," Olsen said. The irrigators would mostly like the litigation to stop. Still, Olsen said some river operations should be changed, citing as an example the small number of juveniles – some 20 percent – that were transported downstream in 2015, a drought year when water levels were low and water was warm. "There is no question that if we're in low water conditions we should definitely transport and get them (juveniles) out of the river," Olsen said. "That was incompetence and if the object was to kill as many fish as possible, that was it. The effects will show up in 2017 and 2018." He suggested that with the conditions of the river in 2015, at least 85 percent of fish should have been barged. He also said that in low water conditions and with a high percentage of juveniles in barges, spill becomes less necessary. The 1978 amendment to the ESA established rules for the God Squad -- a committee composed of seven Cabinet-level members: The administrators of the Environmental Protection Agency and the National Oceanic and Atmospheric Administration, the chairman of the Council of Economic Advisers, a representative of the state in question, the Secretary of Agriculture, the Secretary of the Army and the Secretary of the Interior. neither the federal agency nor the exemption applicant made irreversible commitment to the resources. ESA Section 7(e) creates and describes the committee. Section 7(g) describes the exemption process. And 7(g)(1) says who may apply for an exemption.